Our goal at OCBB is to provide a fun, exciting, and rewarding experience to gamblers everywhere by providing the best information regarding gaming and online casinos. Gambling is entertaining and enjoyable when done responsibly, but we also recognize the reality of gambling addiction and its effects on people’s lives. We encourage everyone who uses OCBB to gamble responsibly, but should you find yourself struggling with addiction, know that we are here to help. It’s never too late to turn around gambling addiction, so please use these resources to get help and increase awareness if you or someone you know does struggle with gambling addiction. The well-being of our visitors is our number one priority. The Mayo Clinic refers to gambling addiction as compulsive gambling and describes it as the uncontrollable urge to continue gambling no matter the toll it takes on your life. It’s important to know that compulsive gambling has nothing to do with how much you win or lose. A player who continually loses may not be an addict, and a player who often wins might still suffer from gambling addiction. Instead, it has less to do with your bank account (though it’s still an important factor) and more to do with the effect on your relationships with friends and family. Addiction can happen at any time, but it often starts casually and plunges into an addiction during a time of high stress or depression. It’s moments like these of which you should be aware if you gamble casually and responsibly. For most people suffering from gambling addiction, it’s less about the money and more about the thrill. That’s why it doesn’t matter if you win or lose, people who suffer from addiction will continue to gamble no matter the outcome. You should no ignore severe symtoms like these. But as bad as they appear, there is still hope to fight addiction head on and turn even the worse circumstances toward a positive direction. Who is the most at risk to suffer from gambling addiction? While anyone is susceptible to compulsive gambling under the most unfortunate circumstances, it is more likely to occur with young to middle-aged men, especially if someone else if their family also suffered from a gambling addiction. This can happen to anyone, but the demographic described is statistically more at risk than others. It’s always easier to stop addiction before it starts. That’s why Prevention Lane (preventionlane.org/prevention-topics/problem-gambling-prevention)(Lane County Public Health), a non-profit organization, works with people who show early signs of gambling addiction so they can stop a problem in its tracks before it becomes severe. Its website has plenty of tips and educational resources to help people identify a problem and cut back or even quit gambling if necessary. If a gambling addiction issue is beyond prevention, you or someone you know could benefit from inpatient or outpatient treatment. 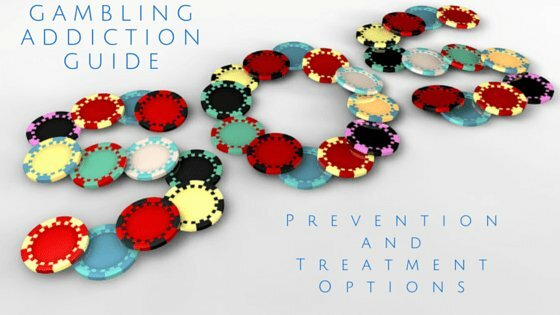 The National Council on Problem Gambling (NCPG) can help you locate a treatment facility in your state. They also offer resources online to help with addiction (as well as prevention resources, in addition to Prevention Lane) and has a 24-hour confidential hotline. If you need to talk to a professional about your problem, you can reach the NCPG at 800-522-4700 or even talk to someone in a live chat on its website. You don’t necessarily need a professional who specializes in gambling addiction to help with your recovery. Any psychiatrist, psychologist, or certified therapist can help talk you through treatment for a gambling addiction. There are cases when they might prescribe medication to help with the depression and anxiety that often follows compulsive gambling, but that’s not always the case. The Anxiety and Depression Association of America (ADAA) can help you locate a therapist in your area and schedule appointments to get started. Even if you don’t immediately discuss gambling addiction, it’s important just to talk to someone. It’s a grim reality, but some people do choose to take their lives due to severe consequences of gambling addictions. Don’t let yourself or a loved one become part of this statistic. Befrienders Worldwide is a non-profit organization dedicated to connecting with people who have suicidal thoughts, whether they relate to gambling addiction or not, and to be a friend to anyone in need. If you or someone you know shows any signs of suicidal thoughts, contact Befrienders Worldwide immediately and talk to someone who can help. Please take these resources like education and not fear. Most people gamble responsibly without any problems or addictions. So don’t take this as a sign not to gamble, but instead to be aware of the signs that lead to addiction. If you or anyone you know shows these signs of gambling addiction, don’t wait. Seek help immediately so you can solve the issue before it takes hold of your life.